Our Strength and Balance Group is a great opportunity for the elderly to get together and do some exercise. The group promotes good health and encourages everyone to get involved in the FUN activities. 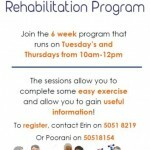 The group runs each Thursday from 10:00 am in our Physio gym. To join the goup please call the Primary Health Care Centre on 50 518 160 to arrange an appiontment for a group assessment.